Second day in Eugene, wandering our AirBnB’s property I happen to come across this tiny house hanging in a tree. 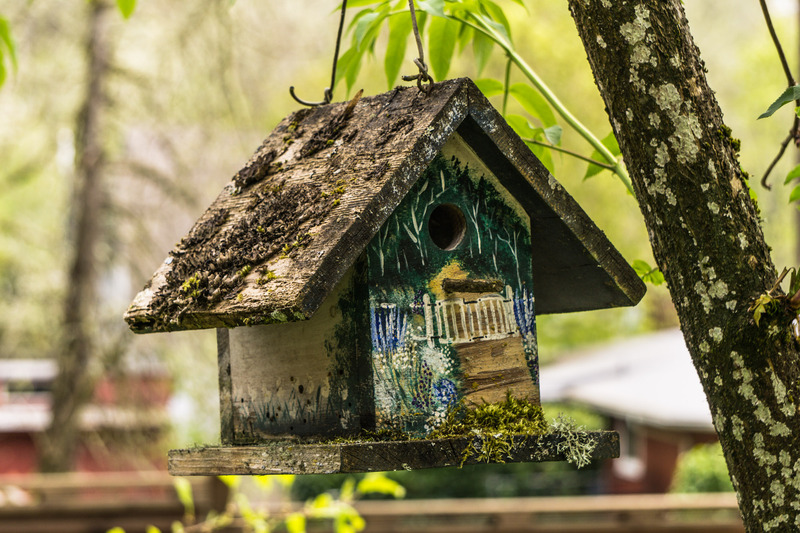 It made me think about our own tiny house, the Cozy Cottage in which we were guests of the weekend, and how small of a house a bird needs to be “happy” as much as a bird can be happy. There was additional evidence that this house had some recent visitors, and I think it was something flying in or out of it that really grabbed my eye. I watched for about 10 minutes hoping to see the occupant so we may discuss the housing market of the area, but I withdrew to our host’s domicile as rains returned to dampen my day. We had a very lovely weekend in Eugene to spend time with birds at the Cascades Raptor Center and to celebrate 75 months together. Audrey spent her early part of the day out and about searching for new birds while I holed-up working on a special art project for a friend. We topped our evening watching Vaux’s Swifts swirl into the chimney of Agate Hall. Just like the Vaux’s Swifts of Portland, they produce a visual tornado that is a feast for the eyes.